Compared to a year ago, there were nearly twice as many single-family houses for sale last month in King County, where the number of closed sales declined. 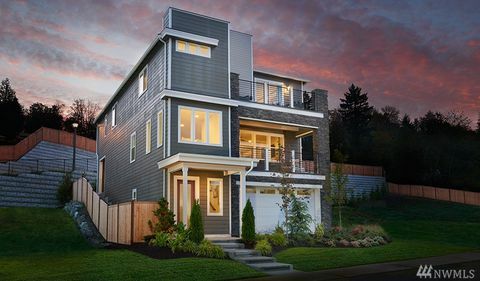 It’s why last month’s median sales price of $667,725 was 3.2 percent lower than March 2018, according to the Northwest Multiple Listing Service report released Friday. In core Seattle markets competitively priced new listings received multiple offers with no contingencies, John Deely, principal managing broker at Coldwell Banker Bain in Seattle, said in a news release. Seattle single-family prices dropped 8.2 percent, with pricey Queen Anne/Magnolia and Leshi/Mount Baker/Seward Park seeing the steepest declines. On the Eastside, though, the median sales price increased 2.6 percent. 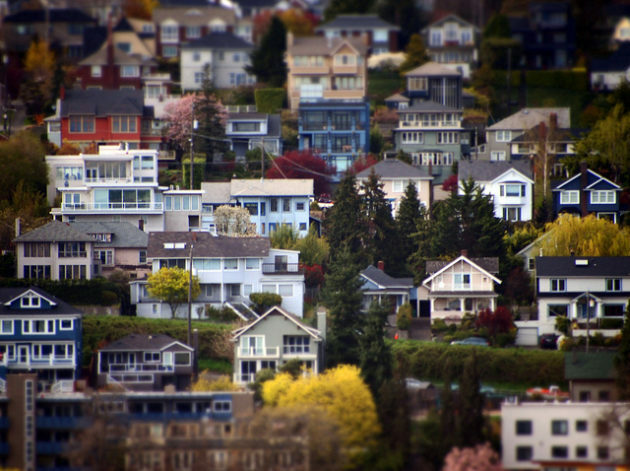 Outlying King County communities saw the steepest year-over-year price hikes. In Enumclaw prices went up nearly 18.8 percent, while Renton’s Benson Hill area and west Auburn saw prices climb nearly 15 and 13 percent increases, respectively. James Young, director of the Washington Center for Real Estate Research at the University of Washington, said areas outside of King County and along the Interstate 5 corridor performed better because people are seeking value outside the main urban center. He expects the spring price growth will be “solid” as long as demand remains. He added that the market is “highly interest rate sensitive,” and this is shown in price trends. Rates are 0.7 percentage points lower than the peak in November. Young said house prices could rise by 8.4 percent and people could keep the same mortgage repayments. Windermere Real Estate President OB Jacobi said with February’s snowstorms over and interest rates back down, buyers are coming back into the market. “The result was a spike in pending sales between February and March (up more than 49 percent), and a pop in price growth in several counties, suggesting we are entering an active spring market,” Jacobi said. The days are warming up, but will Seattle’s housing market recapture its status as the nation’s hottest? For at least one group, it’s still not easy to get in on the housing game. A new report from real estate technology company Zillow shows the city to be the second toughest market in the nation for first-time home buyers. Only San Francisco eclipses Seattle in a ranking that examined the 35 largest U.S. housing markets. New buyers make up 46 percent of all buyers, and more than six in 10 of them are millennials, Zillow says. In searching for markets with low prices, high inventory, more frequent price cuts and strong forecasted appreciation, Zillow’s analysis found that new buyers would have the best luck on the other side of the country, in Tampa, Fla.
Zillow reported that the U.S. housing market has cooled recently and inventory is up 1 percent year-over-year, after being down 8.7 percent last year. It’s the first time inventory has been up heading into home-shopping season in at least five years. Zillow also said the median home value in the Seattle metro area is $491,500, and is expected to rise 3.1 percent in the next year. The company said there are about 5,800 homes for sale. Olsen said that the good news for Seattle buyers is that inventory, however limited, is growing, which should continue to ease competition. After years of relying on a hot tech job market and seeing massive population growth, it may have started to feel like Seattle is running out of room for newcomers, or that perhaps Amazon, the city’s top employer, had cooled on its own growth plans in the city. But Olsen said the numbers are consistent. Metrostudy’s Mark Bound also sees positives outweighing near-term headwinds, at least into 2020. How many ways are there to describe the weakness, softness, deceleration that have laid claim to the current pace and conviction in the new home market? And the short list of root causes for a market slippage–wherever any save for the lowest price tier of new homes are delivered to new neighborhoods–is now a run-on commonplace: Interest rates are up, home prices have lost traction with income growth, tax incentives have been taken out as a favorable factor, etc. Gone now are assurances that price-to-rent comparisons and median household income vs. median home selling prices had been signaling continued headroom and that absorption rates at the higher end of the new-home market reflected ongoing elasticity as the broad economy bounded forward and jobs, wages, and demographics were now wide-open spigots. The talk-track everybody quietly leans toward–by preference and disposition–is one that holds that the slowdown is temporary, albeit more pronounced and now more protracted than might have been hoped. A necessary digestion of interest rates moving upward, and a recalibration of homeownership desire versus current financial means. Once these ephemeral–many experts believe to be psychological–barriers are overcome, the market can proceed, fueled by a fundamentally constructive quartet of forces: economic growth, corporate profitability, wage and income gains, and household-family formation patterns. Ivy Zelman and her team’s The Z Report focuses five of seven bi-weekly data analyses on the recent market momentum reversal’s metrics, tactical responses, and implications for wider construction community worry. Seen through home builders’ lens, the view is choppy and rife with peril, but that’s neither the case for multifamily developers nor remodeling and renovation stakeholders. “37% of builders noted that incentives increased in their markets during September. 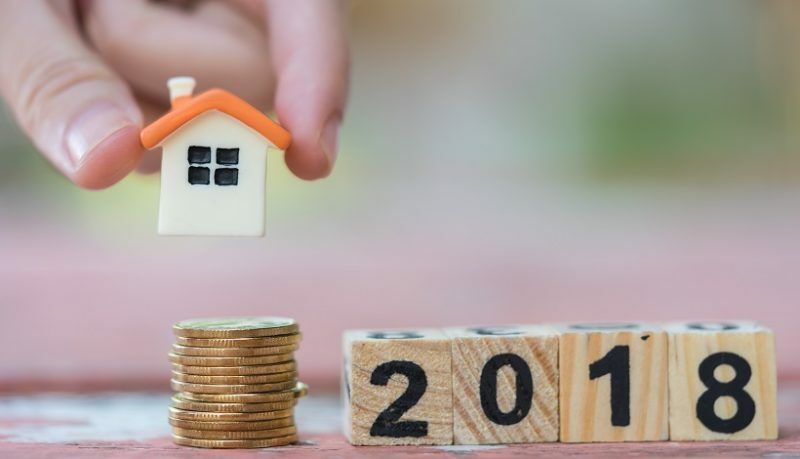 These incentives could relate to price reductions, option upgrades, closing cost assistance, mortgage rate buydowns or increased broker commissions. At this point, commentary suggests that most incentives have been targeted at standing spec inventory. “…Nevertheless, we still strongly believe that the overall supply-demand balance tips in favor of homebuilders and we do not expect a continuous downward trajectory.” Not everybody shares the Zelman thesis–and its basis of assumptions, data interpretations, and projections–but the Zelman team is by no means the exception when it comes to still widely held belief that builders and their prospective customers will recapture some mojo in the year or two ahead. 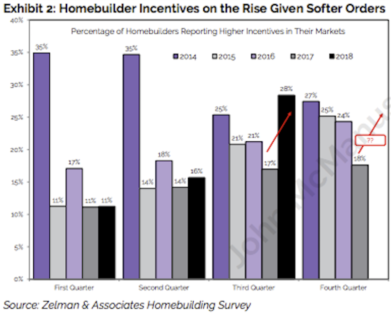 At last week’s Bloomberg Intelligence and Builder sibling company Metrostudy Homebuilding Investor Summit in New York, Metrostudy chief economist Mark Boud netted out with a thesis at least equally favorable as the Zelman outlook. Boud’s caveats include the impacts of interest rates, tariff impacts on pricing, national debt fallout, and Black Swan-type events that can level-set consumer confidence either up or down. Still, Boud’s prediction for the next 12 to 24 months bases itself on under-build vs. over-build and under-valued vs. over-valued fundamentals measures that give historically helpful insight into what’s next for the market. 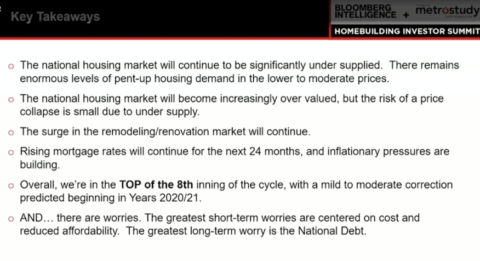 His conclusion, still especially relevant as we head into November with a Major League Baseball season that seems to refuse to end: we’re in the top of the 8th inning of housing’s 6-plus year-old housing recovery. Are you sick and tired of making multi-million dollar educated guesses about what amenities will be most popular in your master-planned community? Here are some findings from our large consumer survey that will help you build and locate the right parks in the right locations. Pocket parks provide the best bang for your buck across all buyer profiles. 53% of all buyers want pocket parks. Children’s play parks make sense only near the communities targeted to young families. 77% of young families want a children’s play park, which is much higher than the 41% of young couples who presumably are planning for kids in the future. Build a dog park near the communities targeted to those without children. 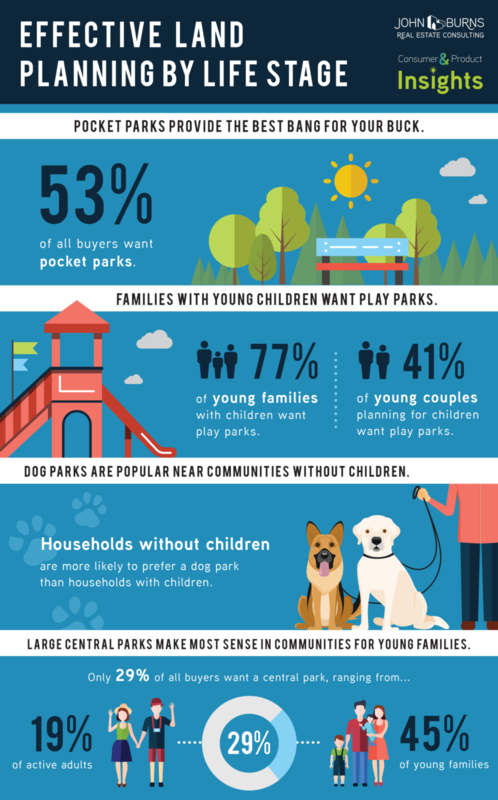 Households without children are more likely to prefer a dog park than households with children. 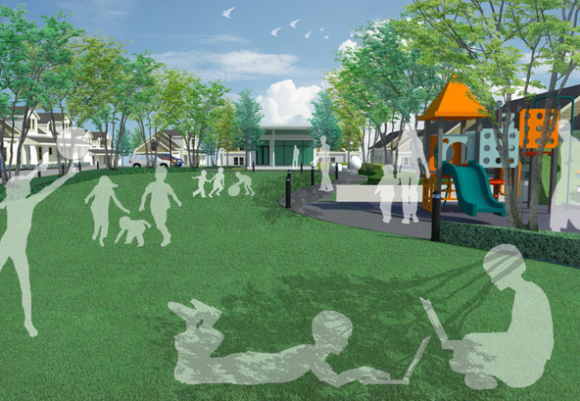 A large central park makes the most sense if you are building a community for young families. Only 29% of all buyers want a central park, ranging from 19% of active adults to 45% of young families. With 23,000 responses, we can determine at the national and local level what consumers prefer. For more information on how to use our Consumer & Product Insights survey, please contact me (Sidney Pell at 858-281-7221) or any of our consultants.